In our last week, we examine what it means to deal with an “as is” home and if it’s something you should pursue. You’ve probably seen listings stating a home is being sold “as is.” Does that mean it’s a dump and not worth seeing? It can be hard to tell since there can be vast differences in the conditions of “as is” homes. These homes can sometimes be a good deal budget-wise, especially if it gets you into a neighborhood you’ve been eyeing. However, some “as is” homes come with more troublesome issues that could cost you more in the long run. Every jurisdiction has different laws when it comes to “as is” homes, and every home and every seller has their own story. You’ll need to be more of a detective if you want a complete picture of an “as is” home. Understand disclosure requirements for different jurisdictions. Some states require sellers to disclose any defects they know about in a home for sale. Maryland and the District require sellers to provide detailed disclosure documents. Virginia, on the other hand, is more of a “buyer beware” state. If sellers, however, know of something but didn’t disclose it, that is considered fraud and the sellers would be liable. Sometimes it is difficult to prove if sellers really were aware of any defects or questionable conditions. That’s why it is important to get any disclosures in writing to protect you in the long run from fraudulent information. Be proactive and ask about any repair history. Did the seller have water damage at one time and made repairs, which now aren’t obvious to the buyer or the inspector? You want to know as much about this home as possible, especially any water damage history. Take cautious steps if seller is a nonoccupant. If the property was owned by someone who didn’t live in the home recently—whether it was a landlord who had been renting out the property, an estate selling for a deceased family member, or even a bank in a foreclosure sale, they can’t disclose something they didn’t know about. So be more vigilant since there could be more wrong with the property than what has been disclosed. Take additional steps to ensure you understand the true condition of a home, both apparent and “hidden.” That way you’ll have a better idea of negotiating and budgeting for this home. Make sure you get a qualified inspector. If you included a home inspection contingency in your offer (which you always should), you are given a window of time to get the house inspected. You can get a thorough idea of the home’s condition. Does it have a leaky roof, any water damage, serious foundation issues, and pest or termite history? The results will help you decide whether you will continue with the transaction or not. You can walk away if you aren’t comfortable with buying the home. Get bids from contractors. If there are necessary repairs to be made, contact contractors during this contingency period to have a better idea of future costs. These estimates could help you at the negotiating table to bring down the price of the home. 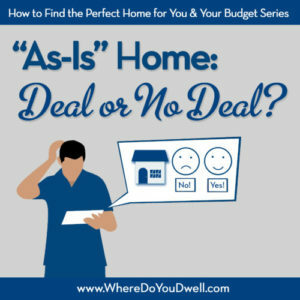 Overall, an “as is” home could be a good deal as long as you take the proper steps to protect yourself. It could be the “perfect” home for you as long as you do your due diligence on your part and have a very thorough inspection by a professional. You’ll also want to completely understand what you’re getting yourself into if it is a home that will need lots of work. Honestly ask yourself if you will have the time, the commitment, the patience, and the budget for undertaking any major repairs and making it more livable to your standards. But remember that you can “take it or leave it” and that’s the beauty of it. If you’re not comfortable, then you can always walk away if you’ve included the right contingencies in your offer with the seller. 12 Questions to Ask Yourself Before You Step Foot in an Open House Before you do anything else, you must evaluate you wants and needs for a home with some self-analysis. Are You a House or Location Person? Buyers tend to lean one way or the other, and by knowing this you can streamline your home search either way. The 3 Steps Most Buyers Skip When Buying a Home You don’t want to mess up one of the biggest financial decisions of your life so don’t forget to do these 3 things. The “Backwards” But Right Way to Finance Your First Home Our way of financing a home will lead you to the right home for your budget. How to Get Everything You Want in a Home Here’s how you can learn to balance your budget, location, and criteria so that you do get the “perfect” home for you. What YOU Need to Know About Buying for Schools Every first-time buyer needs to decide if “good schools” is on their criteria list, or not. Here’s how.